This Joubert-Nivelt Chassiron 43DH ketch from the Richard Shipyard in Marans, Charente-Maritime, France. She sleeps six in three double cabins / two heads and is auxiliary powered by a Volvo Penta MD40A 85hp diesel engine (4800 hours). Engine in excellent condition, professionally maintained. GRP hull repainted in 2007 and anti-osmosis treatment carried out in 2009. Teak deck refurbished completely in 2000. Interior in perfect condition, solid mahogany wood. Rigid rigging revised in 2016 by professionals, Main mast with Mainsail furler, halyard (new 2013), Profurl Furling Genoa (new 2016). Asymmetric spinnaker with sock. Navigation unit NKE Topline, Lorentz Compact 8 GPS (on the helm console), Furuno GP32 GPS, Furuno FR260 radar, Shipmate RS8100 VHF, Simrad AP2 Autopilot. Lofrans 1000W Electric windlass with remote control, Sidepower stern thruster, 7Hp 400A, adjustable davits, bathing ladder, pressurised hot water, fresh water tank: 750 L (2 * 375), Webasto 5DL heater, 2 burner stove / oven, Frigoboat 200L refrigerator. Dolphin 25Ah charger, 4 gel batteries (new 2014) and 2 batteries (gel) dedicated to the engine, Mastervolt Whisper 3500 generator (150hours – new 2004). 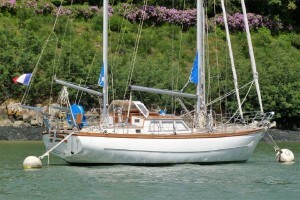 This Chassiron 43DH is well maintained (a list of works and maintenance is available on request). Complete with Zodiac YL310R 4-man semi-rigid tender with Evinrude 7.5Hp outboard. Safety equipment includes an ISO9650 6-man life raft (New 2013 / serviced 2016).